Often one of the most difficult things when new to keeping rats is trying to understand there language. Rats, as with any animal, have a series of complex signals and signs they use to make up most of their communication along with some audible noises. This is backed up by a series of virtually inaudible sounds (can be heard using a specially tuned bat detector) and an even more complex world of smells. As an owner it is very important to be able to understand at least the basics of rat language, this can help you tell what mood your pet is in, how they feel about something and what’s wrong with them when they’re not quite right. A good part of this comes from spending time with your rats, observing their behaviour and interactions with each other as well as yourself, however there are certain things you can look out for that will help you interpret what your rat is saying by looking at what it is doing. 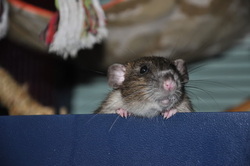 This guide is aimed at explaining some of your rats behaviours and language as well as a glimpse into what they are potentially thinking and trying to communicate. It also touches on some of the ways to resolve undesirable behaviours though there are many more ways out there and every rat responds differently. It should be noted that the guide below covers only the more common behaviours and attempts to explain them. Often these behaviours interact with a number of others as well as particular circumstances within the rats life and this will potentially change the meaning. As mentioned above, understanding can only come from knowing your rat personally and even then; we are not rats, we have not been brought up speaking ‘rat’ and can only understand a fraction of what they are trying to say with our limited senses.